The 8th EPA Summer School on the topic of “ABCs of Psychotherapy” took place in Strasbourg, FRANCE, from 6 to 9 September 2018 and was attended by 27 selected scholars from all over Europe. During the three-day intensive educational programme, the participants took part in interactive discussions, role plays, workshops and simulation sessions organised by our faculty members with a professional actor-patient to develop their communication skills and teach them the basis of how to conduct a psychotherapeutic interview. The scholars were invited to participate in a guided tour of the European Parliament before the Opening Ceremony where Dr. Cécile HANON, EPA Secretary for Education, welcomed the participants and faculty. 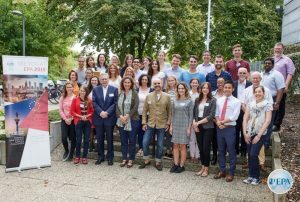 Some scholars got together to write an article entitled “An Integrative Approach to Training in Psychotherapy” to share more information on their experience at the EPA 2018 Summer School. The article has been published in the Free communication pages of the European Psychiatry Journal and is available here. Scholars were able to interact on a diverse range of topics such as systemic therapy, psychodynamic practice and neurosciences, cognitive behavioural therapy or the ethical issues in psychotherapy. Moreover, simulation sessions were an essential part of the training this year. Simulation has been increasingly used in medical education for over 20 years, and offers a safe but realistic environment to practice skills needed in clinical work. In psychiatry, simulation typically includes an actor-patient whose role is essential in giving feedback to the doctor. The scholars were welcomed by EPA President, Prof. Silvana Galderisi, and by Dr. Cécile Hanon, EPA Secretary for Education. An article prepared by the 2017 Summer School participants, entitled “A Comprehensive Initiation into Psychotherapy: Recounting the Interactive Experience of the 7th EPA Summer School” has been published in the Free communication pages of the European Psychiatry Journal. The electronic version of the article is available here. From 9 to 11 September 2016, 27 scholars attended the EPA Summer School organised for the first time in Belgium, at EPA Office in Brussels. Coming from 19 different countries, they worked for several days under the supervision of our faculty, composed of Dr. Marc Hermans, Prof. Yves Sarfati and Prof. Norman Sartorius, on the topic “ABCs of Psychotherapy”. Organised around plenary discussions, workshops in smaller groups and role-play sessions, the Summer School also gave the participants the unique opportunity to participate to a simulation session organised by the Maudsley Simulation Center, UK’s first simulation training centre focusing on mental health. The scholars were welcomed by EPA President, Prof. Wolfgang Gaebel, and by Dr. Cécile Hanon, EPA Secretary for Education. Several motivated scholars co-wrote an article following the Summer School, entitled “A Better Comprehension of Psychotherapy: Reflections on 6th EPA Summer School”, which was published in the free communication pages of European Psychiatry (February 2017). The electronic version of the article is available here. 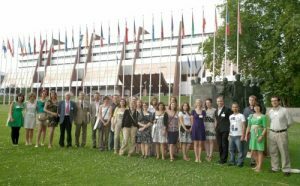 The 5th EPA Summer School took place place from 10 to 13 July 2015, in Strasbourg, France, under the auspices of the Secretary General of the Council of Europe, Mr Thorbjørn Jagland. The important issue of Comorbidity between mental and physical disorders was the main topic of discussions during the Summer School. The faculty was composed of Prof. Norman Sartorius (Switzerland), Prof. Albert Diefenbacher (Germany), Prof. Christoph Lauber (Switzerland), Dr. Henk Parmentier (UK) and Dr. Cécile Hanon (France, EPA Secretary for Education). 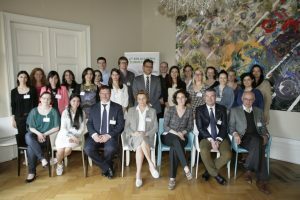 In addition, the Summer School opening ceremony was attended by the EPA President, Prof. Danuta Wasserman (Sweden), and the EPA Secretary General, Dr. Julian Beezhold (UK), and a presentation on the EPA’s activities for early career psychiatrists was given by Dr. Olivier Andlauer (France-UK). For more pictures from the event, visit the EPA Facebook page. An article, prepared by the 2014 Summer School participants, entitled “From the stork’s nest: Young psychiatrists spread their wings and fly” has been published in free communication pages of the European Psychiatry Journal (issue 6, 2014). The electronic version of the article is available here. 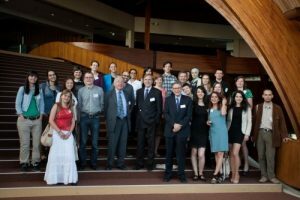 The 3rd EPA Academia Summer School took place place on 7-10 June 2013 in Strasbourg, France, under the auspices of the Secretary General of the Council of Europe, Mr Thorbjørn Jagland. Following its success in 2012, Strasbourg was again selected to host this educational event. The 3rd edition focused on the problem of Comorbidity between mental and physical disorders since this issue has proved to be very important though less covered in psychiatric training curricula. The faculty was composed of Prof. Norman Sartorius (Switzerland), Prof. David Goldberg (UK), Prof. Christoph Lauber (Switzerland), Dr. Henk Parmentier (UK) and Prof. Henning Sass (Germany, EPA Secretary for Education). In addition, Dr. Martina Rojnic Kuzman (Croatia) made a presentation on the EPA’s activities for early career psychiatrists. Traditionally the Summer School participants prepare an article on their experience of the event. This year’s article “Was it successful? A reflection on the 3rd EPA Summer School” was published in the free communication pages of European Psychiatry (issue 7, 2013). The electronic version of the article is available here. The 2nd EPA Academia Summer School took place on 5-8 July 2012 in Strasbourg, France, under the auspices of the Secretary General of the Council of Europe, Mr Thorbjørn Jagland. Strasbourg was selected to host this educational event not only because it is a capital of united Europe but also due to its symbolic significance for EPA: place of creation of the association and location of its headquarters. The second Summer School focused on the problem of comorbidity between mental and physical disorders and disabilities as its first edition, but with different sub-topics, since this issue has proved to be very important though less covered in psychiatric training curricula. The faculty was composed of Prof. Norman Sartorius (Switzerland), Prof. Albert Diefenbacher (Germany), Prof. Christoph Lauber (Switzerland), Dr. Henk Parmentier (UK) and Prof. Henning Sass (Germany, EPA Secretary for Education). Furthermore, the EPA President, Prof. Patrice Boyer (France), welcomed the participants at the opening ceremony at the Council of Europe. 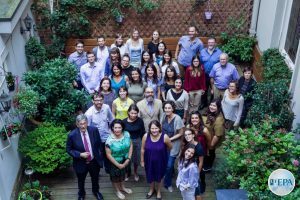 A group of Summer School participants prepared an article on the experience of the 2nd EPA Summer School, which was published in free communication pages of the European Psychiatry Journal (issue 8, 2012). The electronic version of the article is also available here. The first EPA Academia Summer School took place on 6-9 July 2011 in Nice, France. It was focused on “Comorbidity between mental and physical disorders”. The faculty was composed of Prof. Norman Sartorius (Switzerland), Prof. David Wood (UK), Prof. Christoph Lauber (Switzerland), Prof. Norbert Hermanns (Germany), Prof. Kim Brosen (Denmark) and Prof. Henning Sass (Germany, EPA Secretary for Education). In addition, at the opening ceremony Dr. Andrea Fiorillo (Italy) made a presentation on the EPA’s activities for early career psychiatrists. In order to share experience and provide feedback on the first EPA Academia Summer School, an article was jointly prepared by the Summer School participants and teachers. The article was published in the free communication pages of European Psychiatry (October 2011). The article is also available here.